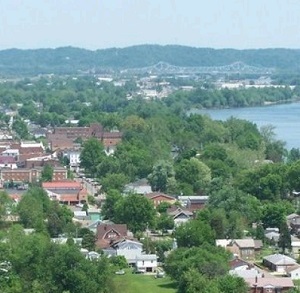 Gallipolis and Gallia County, Ohio is situated along the banks of the majestic Ohio River in southeastern Ohio. There are a variety of indoor and outdoor recreation opportunities available for the entire family. There are also many historical attractions, museums, arts and theatre options in Gallipolis. Gallia County and the Ariel-Ann Carson Dater Performing Arts Centre is home to the Ohio Valley Symphony, the only professional orchestra in southeastern Ohio. There are a couple of movie venues, and many annual events offering Live music to guests. There are 2 airports within one hour of Gallipolis and one regional airport located in Gallipolis. We offer rental car services and transportation for medical purposes. Locally, Gallia County is home to Holzer Health Systems and within a 30 minute drive in Point Pleasant, West Virginia, there is also Pleasant Valley Hospital. Jan 20.5 F° 30.6 F° 40.7 F° 2.9 "
Feb 22.9 F° 34.3 F° 45.7 F° 3.0 "
Mar 30.5 F° 43.3 F° 56.0 F° 3.6 "
Apr 39.6 F° 53.0 F° 66.3 F° 3.2 "
May 50.1 F° 62.8 F° 75.4 F° 4.0 "
Jun 59.3 F° 71.1 F° 82.9 F° 3.9 "
Jul 64.0 F° 75.3 F° 86.6 F° 4.4 "
Aug 62.3 F° 73.7 F° 85.1 F° 3.8 "
Sep 55.4 F° 67.2 F° 79.0 F° 3.0 "
Oct 42.1 F° 55.1 F° 68.1 F° 2.7 "
Nov 33.3 F° 44.8 F° 56.3 F° 3.1 "
Dec 25.3 F° 35.4 F° 45.5 F° 3.3 "
Spring temperatures are cool with averages in the low 50's and highs in the mid 60's. Nights are cold with lows in the low 40's. Summer temperatures are mild with averages in the low 70's and highs in the mid 80's. Nights are cool with lows in the low 60's. Fall temperatures are cool with averages in the mid 50's and highs in the upper 60's. Nights are cold with lows in the low 40's. Winter temperatures are cold with averages in the low 30's and highs in the low 40's. Nights are cold with lows in the low 20's. Condos Over 50 Communities There are a variety of housing options available in Gallia County. There are a few different agencies that can assist with housing options that will suit everyone's needs. Home care Senior center Visiting nurses There are many care facilities available as well as a Senior Resource Center that host many events and activities for seniors. There are many non-profit organizations always searching for volunteers for their organization. We have historical museums, a regional arts facility and several community organizations available.